There was a time when the choice was quite limited when it came to video converters. That time has fortunately passed and today there seems to be no lack of video converters. Thanks to Android’s ability to play almost any video format, and it being the most popular mobile OS, one of the major markets for video converters has just disappeared. Most people aren’t professional video editors and only used to want a video converter to play their MP4 movies and other videos on their mobile phones. This is why most video converters today come packed in with other features to attract users. HD Video Converter Factory Pro goes back to the roots though and focuses on the video conversion instead. Since HD Video Converter Factory Pro is more focused on the video converting aspect, rather than cluttering the software with other fancy stuff, the interface is quite straightforward to use. Even novice computer users will be able to figure out just how to convert a video into a format one wants. If not, there are arrows all over when you first start the converter so this shouldn’t be too hard for anybody that can read. If I were to give points I’d give the interface a full 10 for its user-friendliness. Many video converters today support a wide range of formats and offer various pre-sets based on devices and platforms such as iPhones, PlayStation, Samsung phones, etc. HD Video Converter Factory Pro does so too, and perhaps support more formats than some other converters out there. I haven’t tested them all out so I cannot definitely claim that it supports the most number of formats. But Wonderfox, the developers, claim that it supports up to 300 video formats including MKV, M2TS, AVCHD, MPEG-TS, HD-camcorder, and all the different presets I mentioned. HD Video Converter Factory Pro has so many different presets it’d be really hard not to find a preset for your use-case. The utility can also convert MP4 into MKV and compress videos for email. The video conversion speed is quite fast and Wonderfox actually claims 50X faster conversion speeds. I have no idea what that means but I did test out the speeds in some very non-scientific ways. To give you an idea, imagine a very average PC, specifically with a core i5, 8GB RAM and a 1TB HDD with an RPM Class of 5400. To convert an MP4 4k Ultra HD video (3 minutes and 21 seconds long) to an HEVC 4K Ultra HD video on this machine, it will take more than an hour. I did not have the patience to find out how much more. Converting the same 4K Ultra HD video to a 1080p video in the same format though was only a matter of minutes, around 10-ish. Unless you’re some sort of video professional I don’t see you converting 4K to 4K. Yes, by the way, you can much easily select predefines resolutions between 480p, 720p, 1080p, and 4K. That slider on the right side is really handy, once again points for the interface. Makes it much easier to downscale videos and compress them into a smaller size without losing quality. Talking about compression though, I’d say this is the most interesting part of the conversion process with HD Video Converter Factory Pro. Depending on your conversion formats and resolution it can compress a video up to one-fifth of its original size. In the 4K to 4K conversion that I mentioned above, the video size was reduced from about 287 MB to 243MB. Not a huge change in itself but it is after all a 4K to 4K conversion. At this rate, one can easily save about 100-200MB while converting a video around 1GB in size. The 4K to full HD video conversion had a more astounding 50% compression ratio. Sure HD Video Converter Factory Pro is more concentrated on converting the videos but it does include a downloader because that’s something that is indeed useful. It lets you download videos not only from YouTube but also other popular websites such as Facebook, Vimeo, etc. and it lets you download 4K, VR video, 360-degree video, HD MP4, HD MKV, HD AVI, HD TS, HD ASF, HD MOV, HD WMV, etc. Of course, you can also convert a downloaded video into any other format right on the spot. HD Video Converter Factory Pro knows it is a video converter and I, for one, appreciate it when an app or software is focused on what it was meant to do. That does not mean it is a bare-bones video converter either. Probably not with 4K videos but with slightly lower resolution videos, it does let you play around with video effects. It is more like Instagram filters for videos than something of a professional video editor and that’s a good thing. You can still crop videos, flip or rotate them and of course, trim them. It even lets you extract audio or subtitles off a video. 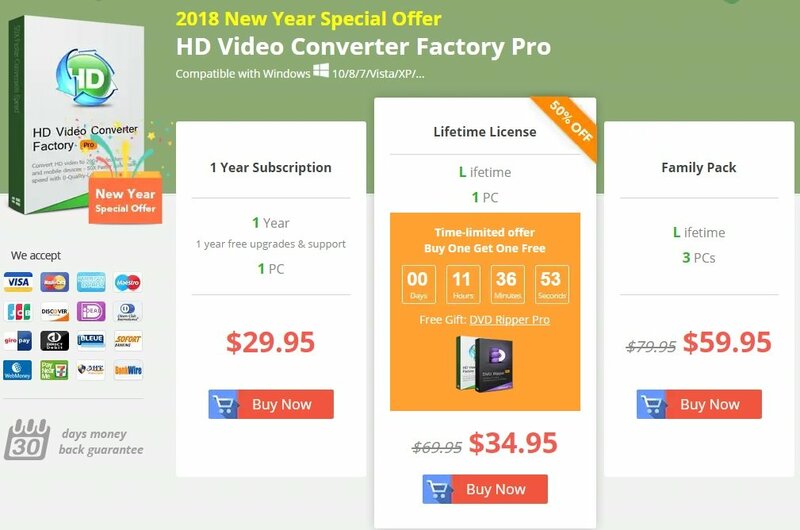 You can try HD Video Converter Factory Pro for free right now and decide whether you want to buy it. Decide quickly though because Wondersoft is running a new year sale and offering a lifetime license at 50% discount.